If you lose your wallet, you’re in trouble. You have a whole bunch of cards (credit cards, but also library cards, work ID cards, and so on) that you need to cancel and replace. And with the looming spectres of ID theft and credit card fraud, the problems associated with losing your wallet can get really nasty, really quickly. What makes it even worse is that all of the phone numbers you need to call to put your accounts on hold are on the cards, in your wallet, which is now in the hands of some baddie. That is, unless you’re right at home with your credit card statements, you don’t know who to call to put a hold on your cards. That can make for a pretty lousy holiday if you lose your wallet en route to your Aunt Betty’s for Thanksgiving. As an early holiday present, then, and to thank you for using PearBudget, we want to offer you a free account at Wallet Garden. Wallet Garden is a really simple web app (even simpler than PearBudget!) — you create an account (again, free), and you enter in the emergency contact numbers for the various cards in your wallet. Then, if you ever lose your wallet (or purse), you have an easy go-to place to find the numbers you need to call. 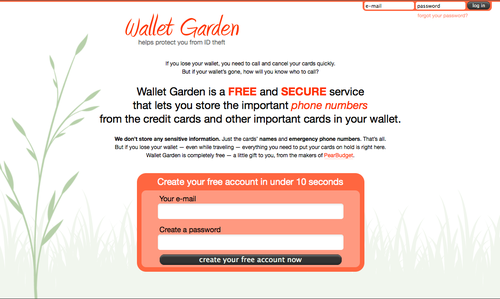 Wallet Garden doesn’t store any sensitive information … just a few phone numbers. Also, you get a few “easter eggs” as a part of your Wallet Garden account. One is that you get a printable page that lists all of your cards and that has a step-by-step walkthrough that explains what to do in the event of a lost card (or wallet). A second easter egg is that at the end of every day where you add a new card to your account, Wallet Garden will e-mail you a list of your cards, so you have a backup in your e-mail account. That way, if you can’t remember the Wallet Garden address, or if you can’t get online (but you can get to your e-mail), or if the Wallet Garden server happens to crash right when you need it, you’ve got all of your data backed up in your e-mail archives. We hope you and your families have wonderful Thanksgivings. And we hope that none of you lose your wallets or purses. But setting up an account at Wallet Garden takes all of 10 seconds, and saving all of the cards from your wallet takes another minute or two. And it’s free. That’s the cheapest peace of mind you’ll find this year. We hope you take a minute now, to save yourself a few hours (and a few headaches) in the future. Go to walletgarden.com now to check it out.